Knosso Prond is one of my favourite models from the Rogue Trader box set and an absolute gift to fans of the grubby underbelly of the 41st Millennium. For a painter she’s an absolutely gorgeous miniature and a far more complex challenge than she first appears, whilst those of us who enjoy the dark corners of the setting can always use a death cult assassin around. As a result she’s been on my “to paint” list for a while so getting her finished off for Fembruary felt like the obvious move. The one thing I didn’t really like about her was the head she’s lugging around, surely a cliché which has long ceased to be worth repeating, so I gave her a second knife instead (you can never have too many of those after all). For over three decades the Rogue Traders who once gave their name to the entire Warhammer 40,000 setting have been lost in the warp or drifting on the shadowy edges of the map. Now they’re back, and they’ve brought a bunch of gribbly Chaos beasties with them. How could I resist this chance to pontificate! Despite Warhammer 40k having existed for over thirty years now, there remain a number of prominent factions who have seen little or no attention from the miniatures’ designers. From Kroot mercenaries to Eldar Exodites there are plenty of options for the developers of the game to explore over the coming years. In recent times many fractions previously lurking in the background have come to prominence, genestealer cults, the adeptus mechanicus and the households of the Imperial Knights amongst them. Launching a whole new race however demands considerable investment of time and resources on the part of the company, and must make for an intimidating proposition. Games Workshop tested the waters with Deathwatch: Overkill, a boxed game which served primarily as a vehicle by which the Deathwatch and Genestealer Cults could be brought back into the game. Now we have Kill Team, building on the concept to form the perfect gateway through which new fractions can be introduced. Some may never grow beyond a handful of models, whilst others could develop in time into mighty fractions hundreds strong. Suffice to say I was already excited about Kill Team but this only serves to increase my interest. First off the blocks then, we have Kill Team; Rogue Trader starring a plucky band of adventurers on a thirty-odd year mission in outer space to explore strange new worlds, to seek out new life and new civilisations, to boldly go where no man has gone before and to exterminate anyone who looks funny in the name of Him Upon Terra. I actually pre-ordered this set, an unusual move for me, although I’m still not completely convinced of its qualities. When it hits it does so with incredible style, but equally when it misses it really misses. Much has already been made of the idea that this is GW bringing the Inq28 aesthetic back into its main range, with repeated assertions in all the promotional materials, that these models spring straight from the mind of John Blanche. Which is great, of course, and to be celebrated and encouraged, of course, but isn’t enough to make a set of models great by itself. What tipped the balance for me however was imagining all of the ways that what I perceive as mistakes could be rectified – and surely for the dedicated converter there’s no bigger draw to a model than that! Before I go any further I’d highly recommend you check out Krautscientist’s excellent review of this set, indeed it was when the comment I intended to post on his blog sprawled to truly epic length that I decided to finish off this review and post it so he actually deserves a lot of credit/blame for the fact that you’re actually reading this. Anyway, without further ado – let’s take a look at the contents of the box, starting with the brave men and women of the New Dawn. The boxset is called Kill Team: Rogue Trader so it makes sense to assume we’d be seeing something suitably impressive from the Rogue Trader herself. The result however is rather subtle, and at first glance almost underwhelming, although it rewards proper scrutiny. Aesthetically the veil over her face is an odd choice. As a concept it works well, and I find myself wanting to like it, plus it puts a stamp of individuality on her as a character. On the other hand it actually strips her of character, making her more aloof, enigmatic and unique but also fades her into the background somewhat when she should be the kind of person demanding everyone’s attention. In Universe it probably serves to increase her authority – after all a person like you is hardly important enough to merit the honour of looking at her face. Out of Universe however she’s a tiny lump of brightly coloured plastic and so needs to work a little harder to be engaging. Having a face would help with that a lot. Ultimately I’m left in two minds by it. If I decided to paint her as Elucia Vhane then of course I’ll keep it, it’s already as iconic of the character as Abaddon’s topknot. If, on the other hand, I decide to use the model as a Rogue Trader of my own devising I’ll replace it with a different head, I have one from a female vampire which might be perfect. I must confess I also expected something a little more blinged up from our first Rogue Trader. The clothes and equipment she wears are nice enough and probably high fashion in the Imperium but I’m surprised we haven’t seen a more ostentatious display of wealth here. Where is the jewel encrusted servo-suit, the feathered riding beast or the servitor-borne sedan chair? Surely she doesn’t just walk everywhere like a commoner? Before I’m accused of damning her with faint praise let me emphasize that Elucia Vhane is a very nice model indeed. The trouble is, she shares a boxset with the likes of Larsen van der Grauss, Knosso Prond and the voidsmen. A Rogue Trader should really be the most commanding and impressive model in any given room, yet poor Elucia is rather overshadowed by her sidekicks and employees. In part Elucia is burdened by being the first of her kind. If she was just another Rogue Trader I think she’d get a lot more leeway in terms of her looks. It’s not fair, and history will probably judge her very kindly, but for the moment this model needs to represent not only Elucia Vhane (something it does very well) but also all Rogue Traders (something which will always be beyond its scope). Something I do really enjoy about her pose is how relaxed, confident and non-competitive it is. This model doesn’t represent her locked in the heat of battle as much as it does her standing at the helm of her starship or perhaps attending a briefing or the most exclusive of parties. If there is a fight going on she’s not launching herself into it like a barbarian queen but standing back and employing others to get their hands bloody on her behalf. Also, in spite of its aesthetic failings, top marks to whoever on the design team recognised that a woman in a veil can also be a woman in charge – there are quite a few bigots across several cultures who need waking up to that idea. There are some truly excellent models in this set but even amongst them Knosso Prond stands proud. There are few characters as iconic of the Inquistiot/Inq28 scene as the Death Cult Assassin. Like the Rogue Trader this was one of the key models in the set to get right and this time GW have managed it in style. I particularly like how the model’s Asian aesthetic has been combined with that of 40k. Here we have someone from an Oriental culture which has changed and evolved over 40,000 years, with a result which is far more engaging than, for example, the cut-and-paste Viking trappings of the Space Wolves. Also, take a look at that head she’s carrying. It’s not wearing a metal mask, making it our only glimpse of the “normal” mutants amongst the Gellerpox. On a more serious note however it’s probably the only thing I don’t like about the model. Surely carrying heads around has been done to death by now? I’d have preferred another blade (a fairly easy conversion to achieve at least) or an open hand as she invites her next adversary to join her in a dance of death. Every crew of spacefaring adventures needs a quirky scientist to look after the tech and amongst the Starstiders that roll falls to Larsen van der Grauss. Of course, given the Gellerpox currently infesting what is arguably the most important bit of the ship (the bit that stops daemons getting in and eating you) it’s fair to suggest he may have been falling down on the job. That’s not something I’m going to hold against him however because once again the miniature is absolutely gorgeous. His complex and archaic equipment ties him in nicely both to the Rogue Traders and to the Adeptus Mechanicus, making him a neat bridging model in a combined Imperial force. The Starstiders team introduces us to the Rogue Traders as a faction and Larsen repeats the trick in microcosm by showing us a previously unseen agent of the Adeptus Mechanicus, the Lectro-Maesters. Like the electro-priests we’ve already seen these are initiates of the Motive Force but whilst those previously released models represent frothing fanatics these are artisans and explorers constantly questing for new sources of energy with which to supply their Forge Worlds. Indeed the background fiction compares them to missionaries, a popular position amongst the priests of Mars. Dammit Elucia, I’m a doctor not the unwitting pawn of a dark god! As every crew of space-faring adventurer’s knows it’s a long way to the nearest hospital so it pays to bring a doctor with you. The task of providing medical support to the Starstiders falls to Sanistasia Minst, and as is often the case with medical professionals in the Warhammer universes, the more closely you read her background the more you start to discover her involvement in sinister goings’ on. As well as being a doctor she’s also a Rejuvenat Adept, charged with extending the lives of wealthy clients alongside performing various other act of healing. Of course, this is the Imperium where doctors carry concussion grenades and a life isn’t saved for its own sake but rather to ensure the wounded get back in the fight as soon as possible. Like Vhane, she’s not shown in a combat pose (unless you count stepping on the head of a Nurgling, itself a nice metaphorical touch). Once again this is a good thing, and although she could undoubtedly give someone a nasty scratch with those scalpel fingers – which is probably the point of them – her job is to be a healer and the killing is best left to other people. She even manages to look very young which, giving up her job is to keep other people looking young too, is a clever bit of design work. it also creates a slight air of naivety about her which ties in neatly to her backstory. There’s a lot of debate going on at the moment over whether the coloured plastics used by GW in some of the more recent sets is more brittle than the grey stuff we’re used to. Lots of technical information has been thrown around and as ever I’ll bow to the greater knowledge of the experts, but I will note that, based on this set the green plastic used for the Gellerpox Mutants seems to be fine whereas the red is distinctly more brittle, leading to real problems with fine details such as Sanistasia Minst’s bladed fingers in a way that I just wouldn’t expect in a normal GW kit. Continuing to plunder the wonderful world of classic sci-fi tropes, here’s the chief of security, the guy we all look to when the killing starts, Voidmaster Nitsch. I know it’s just my personal taste but I find models wielding two-handed weapons one-handed irritates me a little, especially when they’re using the free hand to wield yet another weapon. Space Marines are particularly guilty of this but Nitsch flirts with it too. I see the story that the model intends to convey, the switching from one weapon to another, the range of firepower that he brings to bear, the fact that here is a man who can never have too many guns, and it works – but only just. What I do like however is the way he looks smartly turned out but still utterly lethal and competent as a killer. From the bodyguards of a mafia don to James Bond there have been plenty of people willing to prove that wearing a suit in no way prevents one from becoming proficient at the art of murder and Nitsch looks ready to step from having dinner with the planetary governor to handing the wet-work and back again without breaking sweat. Overall then he’s another success – it’s just a shame about the guns. With mutant hoards on the march a big man with a rotor cannon is just the kind of chap you want around. It’s a classic of action movies and for good reason, so Grell makes for an excellent addition to the squad. My only criticism is that I would have preferred an alternative, preferably helmeted, head – the little cap really doesn’t work for me at all. Expect a quick head swap when I get around to him. He is quite big compared to a guardsman but this is the Imperium where the scale of a normal unaugmented human varies considerably anyway. After all if a Goliath ganger can indulge in a growth stim habit then a rogue trader can undoubtedly afford to make the guy who carries the rotor cannon suitably sturdy as well. Tough though Nitsch and Grell appear to be they’re not going to fight off the Gellerpox alone. Luckily they don’t have to, because there are three more Voidsmen in the box. I know it’s a common refrain of mine but there’s really nothing original, exciting or “40k” about the Cadians and Catachans. The Tempestus Scions are great, never let it be said otherwise, but we could still really use a kit for making baseline human soldiers of the Imperium. Like the Scions the Voidsmen demonstrate just what GW could do here if they put their minds to it. In fact just looking at one finds oneself wishing for a multi-part kit and the chance to start a whole army of them. And before you snort your derision and dismiss this as wishful thinking keep in mind that we just saw this with the genestealer aberrants so who knows what the future might hold? As a little aside it’s nice to note that although one of the Voidsmen is in fact a Voidslady this wasn’t something I noticed immediately. It’s not that she’s sexless or lacking in femininity, just that it’s rather more subtle than it once would have been. Hopefully the days are past when she would have gone into battle wearing enormous armoured cones on her chest like the love child of Maddona and Magnus the Red. I know this is hardly news these days, especially since the latest Stormcast release, but it’s still a welcome development and worth acknowledging and praising, especially with new Sisters of Battle on the way. 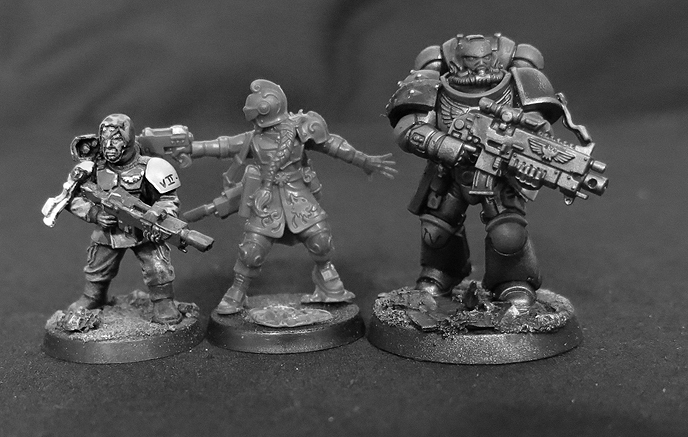 It is worth noting that the Voidsmen are rather big compared to a baseline guardsman. In part this will be due to scalecreep, in part to the better diet they enjoy working for a Rogue Trader. Overall it’s not a bad thing, it still falls well within the range of heights normal amongst human’s today, but it worth being aware of nonetheless. Fear not though – next to a Primaris Space Marine they still look suitably frail and mortal. Finally we have what may be the best model GW has released in the entirety of their history. Rather overenthusiastic praise? Perhaps, but would you say it to his face? After all, he’s such a good boy! It’s that true hero of the Imperium; Aximillion. Something I hadn’t realised until I actually got the kit was that he’s really quite a little dog. Here he being taken for a walk by an Imperial Guardsman. It’s also nice to see that GW’s skill at sculpting canids has come on a long way in the years since the terrible Fenrisian wolves were released. Next to Macula from Necromunda however he looks like he’d be little more than a snack for the bigger dog. Insert joke about cheering for the underdog here. Of course one of the many nice thing about dogs is that they come in all shapes and sizes so although any fans of House Orlock who are hoping for an alternative model to represent a cyber-mastiff maybe slightly disappointed by his lack of stature he’ll still work nicely in all kinds of other Inq28 scenarios. So, whilst Elucia Vhane and her crew have been busy claiming new worlds for the Imperium, down in the engine room things have been going very wrong indeed. Ready to frustrate the plans of the Rogue Traders and spread all kinds of merry havoc we have the other half of the box; the Gellerpox Infected. As a notorious fan of Chaos you’d think this would be the part I’m most excited by but in my view this is where we see the greatest design miss-steps. I must emphasise, it’s not all bad, indeed most of it is very good, but it’s on this side of the box that I see the most things that I’d prefer to have been done differently or that I’d like to change. In part though that may be because I am such a fan of Chaos and so I have my own aesthetic expectations which I’m imposing on these models. However whilst the Starstriders feel very much like a team this lot seem more like a loose affiliation of monsters, giant mutants, outsized insects and zombies with no common purpose or mission beyond running amok. Again this is not necessarily a bad thing, and I’ll certainly find plenty of uses for them in my collection, but there is no denying that whilst the Starstriders are a tight knit team these are a collection of odds and ends cobbled together, and it shows. The big boss of the mutants is, Vulgrar Thrice-Cursed, also known as the Twisted Lord, a towering, stamping, three-headed, four armed machine man with a boiler for a belly. Unlike his opposite number Elucia Vhane he’s unquestionably the one in charge and definitely one of the standout models from the Chaos set. The marks of Nurgle’s influence are present but they’re subtle and whilst this could have been a grab bag of clichés the designers have demonstrated the courage to get outside their comfort zone with the god of plagues and have reaped the rewards for doing so. He reminds me of the Remade from China Miéville’s New Crobuzon novels, condemned criminals who are grafted with machine parts by way of punishment. As I recall there was at least one who had a boiler installed in place of their guts and had to beg and steal to find enough coal to feed it. The boiler however is actually my main issue with the model. I know space on sprues is going to be an issue and all kinds of other design issues must come in to play but I really would have preferred it if the flames emerging from the grill on his gut were a separate piece that could be left off easily. To my eye the sculpted flame here is an example of overdoing things which sadly blights this half of the release. That said I still think he’s ace and even went so far as treating myself to a second model of Vulgrar via eBay, which I’m hoping to turn into a Goliath ‘zerker. Watch this space! On the Chaos side of the set the centrepiece models are the Nightmare Hulks, towering mutants grown from the most blessed of the Gellerpox infested crew. Twisted almost beyond recognition by the power of the Warp these men are mere steps away from becoming Chaos Spawn, and indeed would serve very nicely as proxies for exactly that. As befits creatures spawned from humanity’s nightmares these three each play to a certain archetype; the mad butcher, the man-beast and the horror from the deeps. First up then, the butcher, or as he should properly be called, Gnasher-Screamer. Just when you thought GW had done all they could with the trope of Nurgle models having mouths in their stomachs eh? With all them leading directly into his belly he’d also make a fine ogre Gastromancer (assuming those still exist in AoS). There’s something truly horrifying about all the mouths erupting from the stomach, but then the designer has over-egged everything by adding cartoon faces to the arms. In my opinion this is a real miss step, distracting attention away from what should be the key feature whilst bringing little to the model themselves. My first move on getting hold of him was to carve them off, not too difficult to do but definitely demanding have a steady hand and a sharp knife. I also went for a different head, the big-haired cartoon redneck look doing the model no favours. Personally I’m much happier with the model now but of course if you feel differently please let me know in the comments box below. The sheer size and bulk of these chaps also bears repeating, despite of the promotional photos I don’t think I’d realised how big they are until I saw them in the flesh. Here’s the Gnasher-Screamer towering over my long-suffering guardsman. Whilst Gnasher-Screamer is a cannibalistic monstrosity, the Writher appears to have been sewn together from deep-sea beasts and bloated corpses. The designers definitely deserve extra points for this one, despite its bulk it seems to float forward as though carried by the tide. The ghastly face looking out through the hole in his belly is a nice touch, albeit one that the official paint job covers up rather than accentuates. The hooded head would be a fine addition to a unique looking Nurgle lord or similar character, whilst the octopus arm would make an excellent head for a marine-themed monster or daemon prince. Perhaps it’s my resurgent interest in Blood Bowl, perhaps it’s just the fact that Nurgle’s Rotters were released only a couple of weeks ago, but it strikes me that the Writher would also be perfect as a Rotspawn, the “big guy” for Nurgle teams (he certainly features, as the rules describe, a Foul Appearance and a Disturbing Presence, and he has plenty of tentacles to boot!). Now at the time of writing we have just seen early images of an official model for the Rotspawn but frankly I’m not a huge fan of it compared to my mental image of a converted Writher. The designers have a really laid the nautical theme on thick here, beyond the octopus arm he is encrusted with barnacles, impaled by a harpoon, snagged with fish hooks (one of which even has a fish attached) and even wearing a seaweed loincloth. Even alongside the hook hands, peg legs and other piratical trappings of the Glitchlings and Gellerpox mutants he just doesn’t quite fit in to 40k. Indeed there is not a single futuristic component on him which means he could transfer to AoS with ease. Indeed, if he was an AoS model I’d be sceptical that he could easily be made to fit into 40k. Slap some suitable shoulder pads and a helmet onto him however and he’d be more than ready to take to the Blood Bowl pitch. The third hulk is Big Spike, who’d probably be the best of the three if it wasn’t for the fly head that replaces his arm. I do enjoy it when chaos comes with lots of crazy mutations but for my taste the fly arm is just a bit too much. a tiny withered arm on one side to offset the huge claw on the other would be great but this is overkill – most likely I’ll be chopping off the fly head and using it elsewhere, (unsurprisingly I’ll probably use it as a head). Falling somewhere between the plaguebearers and poxwalkers in design, but with a touch of punk-rock peacocking to boot, we have the Gellerpox Mutants, undoubtedly the models about which I’m feeling the most divided. The pirate theme hangs heavily here in peg legs and hook hands. I found myself half expecting them to throw in a few eye patches and some servo parrots whilst they were about it. Individually each one is great when you put them all together the result is a little gimmicky. As cool as zombie pirate punks may seem on paper they don’t quite gel in practice. As for the metal masks they make for fine bits for conversions or simply by way of adding some suitably weird 40k vibes but the fact that all three have them calls for an explanation and we end up with some faintly shoehorned sounding talk about metal flowing out of the Geller drive and encasing their heads. If they had to have masks then why not give them some more in keeping with their role as engineers? Gas masks, welding mask, ad-mech gribby masks, pre-infection cybernetics, there were surely a range of better possibilities than goofy metals skulls? Once again it seems that GW chose a quirky cartoon zanyness over the dark realism some of us would have preferred but that’s true across the set, indeed across their whole range, look no further than some of the faces on the Nightmare Hulk’s for instance. The masks do however make for rather stylish additions to other models (in my humble opinion). I’ve already shown you this model but dammit I’m proud of him so I’ll show him again! What strikes me as odd is how few of them there are. We’re used to zombies appearing as great hoards and so it’s easy to conclude that a huge tide of plague mutated crewman would be trying to overwhelm the comparatively elite voidsmen. The background even describes them as a “gruesome horde”. In actuality however we only get three of them, which only serves to emphasise their flaws. If any one of them was released alone as a special character it would look excellent, and equally if there were a few more the whole thing might start to work as a gestalt carnival style mass. Despite these criticisms I actually really like these models, in fact I wish there were a few more of them instead of all the giant insects. The Glitchlings are basically Nurglings with a tech/pirate veneer. There’s not a lot to say about them but there’s certainly nothing to complain about either. There’s also not a lot to add regarding the various other small gribblies to be found in the box. Collectively known as Mutoid Vermin these are the various invertebrates which live in the guts of the ship and, once exposed to the energies of Chaos, have grown to unnatural sizes. In appearance they’re painfully generic which is both a blessing and a curse. On the plus side they’d fit in almost anywhere in either 40k or AoS, from the marshlands of Ghyran to the sump-drains of Necromunda. Regardless of where your interests lie amongst GW’s universes there’s a good chance you’ll find a use for these. On the other hand there’s really nothing unique about them. The same warp energies that turned machines to living metal and gave men claws and screaming mouths for stomachs just took normal insects and made them bigger. Personally I think I would have preferred to see something more iconic of the setting; hybrid beasts, insectile chimeras, corrupted servo-skulls and the like. By making them so generic these feel a lot like filler designed to bulk out the otherwise fairly lean body count amongst the chaos range. The grubs especially remind me of the larvae from Rackham’s Dwarves of Mid Nor although – despite the technological leaps and bounds we’ve seen since those were released – the newcomers still don’t hold up in comparison. Overall then it’s a mixed bag although on the whole I’m pleased with it. The Skywalkers – sorry, Starstriders – are an excellent little crew that I can only hope will pave the way for a future Rogue Trader range. On the other hand the Gellerpox set contains a mixture of standout models bulked out by insectile filler with the designers seemingly not quite sure where to draw the line on mutation. The nightmare hulks are generally great, or can be made so with a little work, and the other Gellerpox mutants are nice enough individually but rather too quirky as a group and fail to really fit in with the broader chaos range. The insects, whilst I’ll find a use for them, are definitely the weak link here however and should have been thinned down with at least some of them replaced by more interesting gribblies. In the end it’ll take a little work to turn me into a devoted worshipper of the Geller Drive but the Rogue Traders were well worth the thirty year wait. Of course I’m always interested to hear your views, if you agree or disagree tell me so and if you have any clever conversions planned for these I’m all ears (I even have one on my ankle).